This winter, I couldn’t get enough Christmas dinner, so we’ve been re-enacting it every couple of weeks. Roasted chicken is my absolute don’t-mess-with tradition for this meal, and I need leftovers. In this land of plenty, free range chickens are available from many farmers, and my favourite is Maple and Ewe. Their chickens are large, like at least 6 pounds. This makes them a bit of an investment, but you can make at least three meals of one (and enjoy each immensely!) They take a couple hours to cook, and they are so flavourful that I just add salt and pepper, throw it in the oven, and back off. I roast mine at low temperature, about 300°, until it reaches about 175° in the thickest part of the breast. Then I cook a mini array of vegetables, make some gravy, and we’re feasting like the Kings and Queens of Winter. It is really worth searching out a decent bird for your family. Not only will you be supporting the local economy, you will be rewarded with unparalleled flavour for practically no effort. A larger chicken yields more meat per pound, so go ahead! 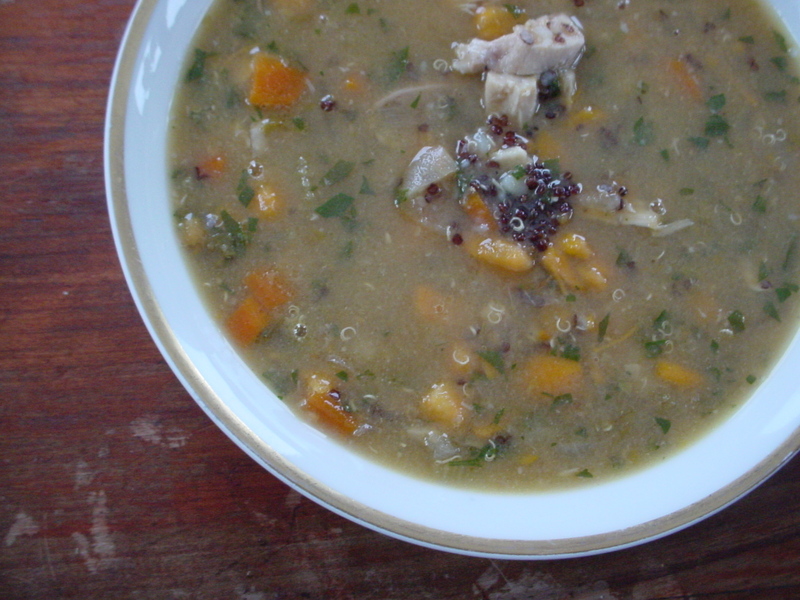 Leftover cooked chicken can be made into chicken soup, added to salads and sandwiches, or incorporated into a new dish over the coming days. Maple and Ewe free-range chickens are available at Meadowbrook Meat Market and the Wolfville Farmer’s Market. Preheat the oven to 300°. Put the chicken in a metal roasting pan and rub with salt and pepper-I use lots. Roast in the middle of the oven until the thickest part of the breast reaches 175°. Let the chicken rest while you prepare vegetables or whatever. Leaving the juices behind in the pan, carefully lift the chicken onto a serving platter. I remember it being a big deal to carve the holiday bird, but we don’t need this kind of fuss. Just remove the leg/thigh after the bird cools a bit (resting will make the meat juicier anyway). Then cut them in half (there is a natural divide, so this is easy). Gently pull the breast meat off and cut it into several chunky pieces. For the gravy, take the pan the chicken cooked in and set it over a burner. It won’t fit, don’t worry. Turn the burner to medium and scrape the pan with a fork. Sprinkle in a few tablespoons of flour and work it into the juices and fat. Add about two cups of water and stir it up like crazy (you might switch to a whisk at this point), getting into the corners of the pan so all of the liquid gets a turn directly over the heat. Add salt to taste, and maybe a little rosemary or thyme. Continue to stir and cook while the gravy bubbles and thickens. If it’s too thick, thin with a bit more water. Serve the chicken and gravy with lots of veggies. Refrigerate the leftover chicken and gravy. Later, or the next day, completely strip the chicken carcass of meat. Put all the bones and bits of skin into a large pot and cover with water. Set over medium-low heat and cook for several hours, then strain. This is now the base of a delicious chicken vegetable soup. Maybe you don’t need a recipe for this. Maybe you do. In any case, feel free to add any vegetables you like, including whatever leftover cooked vegetables are in your fridge. I also like to add a handful of uncooked red lentils, quinoa, barley or rice just before stirring in the stock. Make sure your grain is cooked completely before removing the soup from the heat. Your stock should have a thin layer of fat on top. Spoon a little of this off carefully and place in a large pot over medium heat (you can use olive oil if necessary). Add the onion, celery, carrot and garlic and cook for twenty minutes or so, stirring often and breathing in the amazing aromas as the vegetables caramelize slightly. Add the sweet potato, chicken stock and optional grains and bring to a near boil, then reduce the heat and simmer until the sweet potato is tender. Add parsley, chopped greens and chicken and simmer until greens are tender. Season with salt and pepper.